The summer season is a great time to complete home repairs, when the weather is warm, the windows are open and we’re motivated to scrub things down and fix things up. With all that sunlight streaming through the window, you may have noticed the tile and grout on your floors and backsplashes are a tad grimey. The grout is dirty, discolored, cracked or crumbling, and perhaps hairline cracks and chips in your tiles are more noticeable than ever. Your first instinct might be to grab your bucket and bristly brush, without realizing that your efforts to clean and repair your grout are doing more harm than good. The best way to clean your grout and avoid further damage is to hire a qualified technician to assess the condition of your tiled surface and make a plan for cleaning, restoration and protection. The grout holding your tiles in place on the floor or wall is a type of sandy cement that is applied while wet and dries in place. By its nature, grout is a porous substance, meaning it’s filled with microscopic holes that collect dirt, grime and moisture over the course of time. These two properties — sandiness and porousness — make it tough to clean. 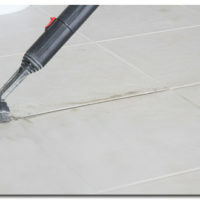 Scrubbing grout loosens the sandy particles, making it more likely to crack and crumble. This happens gradually, so many people don’t realize they’re inflicting damage until it is too late. Additionally, scrubbing isn’t even an effective method for cleaning grout. Scrub brushes can’t adequately get into the grout’s pores, and your wash water might actually be depositing dirt into the grout. Call The Grout Medic of Northern Virginia, or another local office of The Grout Medic, and benefit from our expertise in cleaning grout. 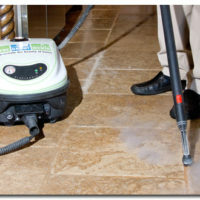 Our steam-cleaning system penetrates the pores of grout, pushing the dirt out and leaving a fresh, clean surface. If your cracked and crumbling grout is ruining the look of your bathroom or kitchen, it’s time to replace it. Before you jump into this ambitious home improvement job, understand what it takes to properly apply grout so that it will stay intact and looking great for years. If grout is mixed poorly or applied improperly, you risk it quickly cracking or crumbling again. Even worse, cracked grout allows moisture to get underneath your tile, encouraging the growth of mold and mildew. Allow the experts at The Grout Medic to do your tile regrouting for you. We are specialists in knowing the perfect formulations and applications for the grout in your home. Call The Grout Medic of Northern Pittsburgh to learn more, or find your local Grout Medic office. Don’t replace all your tile! A beautiful room can be marred by the sight of a floor or backsplash with missing tile or tile with hairline cracks or chips. Instead of replacing the entire tiled surface, The Grout Medic can perform repairs and replacement of individual tiles, depending on its condition. Using our knowledge and experience, we’ll evaluate your current tile and let you know where repairs and minor replacements are possible. We will also make recommendations for color matching or redesigning your tiled area. It’s all part of the super-focused services we offer from all our locations, including The Grout Medic of Huntsville-Decatur, Alabama. Contact The Grout Medic for all your needs when it comes to cleaning grout, tile regrouting, tile repair, water damage repair, and more.